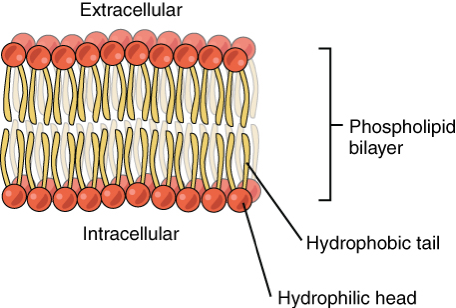 The phospholipid bilayer is composed of two layers of lipids. Each lipid contains a hydrophobic (water repelling) tail and a hydrophilic (water attracting) head. The lipids form into a bilayer with the hydrophobic tails facing the interior of the bilayer forming a hydrophobic region held together, in part, by intermolecular forces between the tails. The hydrophilic heads form a hydrophilic region on either side of the bilayer that can interact with the water rich environments on either side of the bilayer. The length of the fatty acid tail impacts the fluidity of the membrane. This is because the intermolecular interactions between the phospholipid tails add rigidity to the membrane. As a result, the longer the phospholipid tails, the more interactions between the tails are possible and the less fluid the membrane will be. As temperature increases, so does phospholipid bilayer fluidity. At lower temperatures, phospholipids in the bilayer do not have as much kinetic energy and they cluster together more closely, increasing intermolecular interactions and decreasing membrane fluidity. At high temperatures the opposite process occurs, phospholipids have enough kinetic energy to overcome the intermolecular forces holding the membrane together, which increases membrane fluidity. Cholesterol has a somewhat more complicated relationship with membrane fluidity. You can think of it is a buffer that helps keep membrane fluidity from getting too high or too low at high and low temperatures. At low temperatures, phospholipids tend to cluster together, but steroids in the phospholipid bilayer fill in between the phospholipids, disrupting their intermolecular interactions and increasing fluidity. At high temperatures, the phospholipids are further apart. In this case, cholesterol in the membrane has the opposite effect and pulls phospholipids together, increasing intermolecular forces and decreasing fluidity. Phospholipid tails can be saturated or unsaturated. The terms saturated and unsaturated refer to whether or not double bonds are present between the carbons in the fatty acid tails. Saturated tails have no double bonds and as a result have straight, unkinked tails. Unsaturated tails have double bonds and, as a result, have crooked, kinked tails. 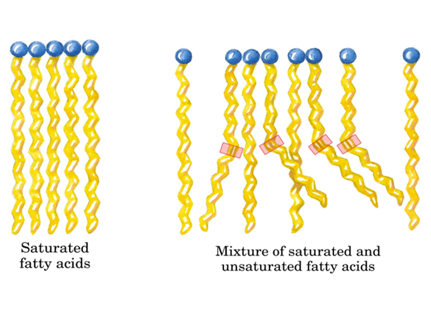 As you can see above, saturated fatty acids tails are arranged in a way that maximizes interactions between the tails. These interactions decrease bilayer fluidity. Unsaturated fatty acids, on the other hand, have more distance between the tails and thus fewer intermolecular interactions and more membrane fluidity. Are you looking to connect with a biology tutor in Boston, New York, or online? Want to read more from Eden?